It was just last year when a newly imagined Project Pabst made it's debut down at the Tom McCall Waterfront Park. With a fairly eclectic lineup for the actual festival and the night shows as well, patrons flooded in and out of the entrance gates with the gears in their heads turning as to how they felt about the festival's new style. It's almost impossible to pull anything off without a couple hitches along the way, but Project Pabst soldiered through another year of big acts and big piles of beer cans. The same is still true for 2017, just a couple of things seeing changes. This year's fest is scaled down in a few ways, but has grown a lot in others. Unlike the Project Pabst's of the past, the 2017 edition won't have any night shows at all. These night shows were held at various locations around the city and gave more opportunities for local acts to participate in the festival. Last year, Kyle Craft was the only local to make it to festival's main stages. Project Pabst night shows also offered more in genre variance, since many of the festival's metal shows happened at night. Local support this year comes but from just one local artist each day, though the ones chosen are two of the best in the city and have both been voted our Deli Portland Artist of the Month in the past. Opening up Saturday's festivities is the Last Artful, Dodgr. She happened to have played one of the night sets last year, but her distinct vocal style and bomb beats are perfect for the bigger stage. For Sunday's sets, harsh post-punk group Lithics will be kicking things off. They've become more of a common name around town over the last few months, especially after basically being named the best new band in Portland by Willamette Week and participating voters. 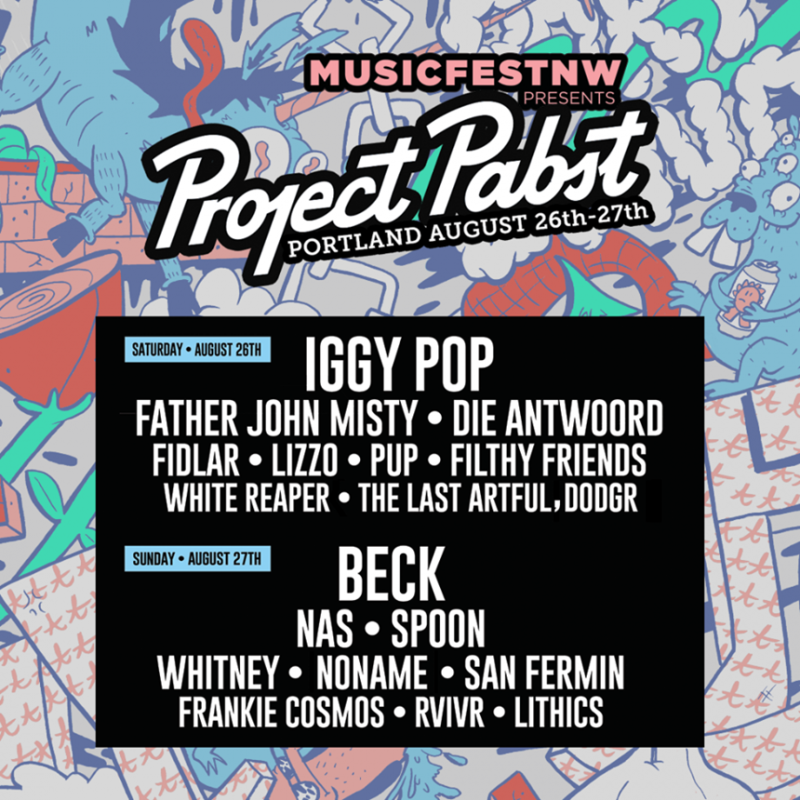 What sets this round of Project Pabst apart from the others are the headlining acts. This isn't to say that Duran Duran, Ice Cube, Tame Impala and Ween didn't totally kill it last year, or that Tears for Fears didn't a few years back. But each day this year has a pretty damn good trifecta of artists to close out everything. Attendees will get a chance to see Spoon, Nas and Beck on Saturday, while Sunday patrons will get a little bit of good, old and controversial. South African "rap" duo Die Antwoord have been contentious musicians from the start, but the reasons that make them such could create problems for Portlanders at the festival. Die Antwoord is known for committing racial and homophobic acts under the guise of shock value, like using the n*word in their songs, dressing in blackface in music videos and referring to people as f***ts, so it will be interesting to see how the crowd will react if they pull anything go the sort on stage. To detract from whatever potential drama that could happen, the coolness of singer-songwriter and all around pop culture jokester Father John Misty, along with the iconic existence of still-kicking-it rocker Iggy Pop guarantees the festival will end on a good note. For those that want to keep the party going, a Project Pabst Cooldown party will be happening back across the bridge at the Know. This bill is all local, featuring Blossom, Myke Bogan and Foreign Talks from Vancouver, Wa. This is one of the festival's best bills yet and tickets are still available, so get yours before the chance is lost. Visual Vices: The Last Artful, Dodgr & Neill Von Tally - "Caverns"
With one of the most recognizable voices in the game right now, The Last Artful, Dodgr certainly knows how to turn something good into something incredibly great. Teaming up with producer Neill Von Tally has proved an even greater endeavor, as Von Tally's beats make for the best presentation of Dodgr's matchless take on R&B and hip hop. Having already released their debut as a duo, the Fractures EP, last year and a collab EP with Myke Bogan earlier this year, the pair have shared with us the second single to come off their first full-length Bone Music. 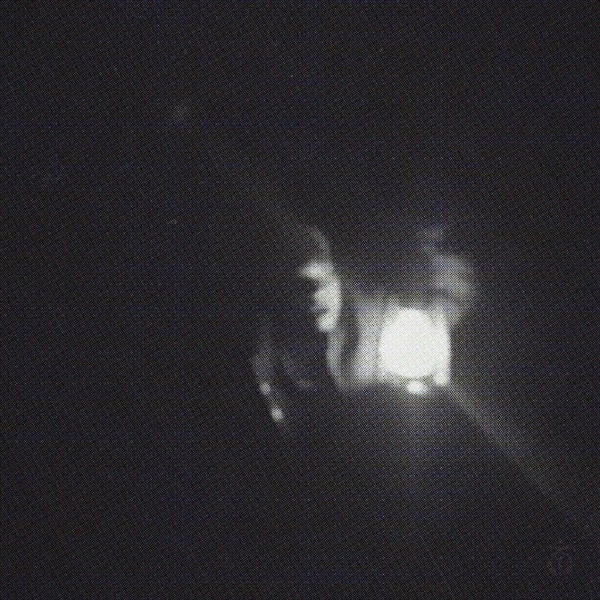 "Caverns" as a video is just like it is as a track - incredibly smooth in its minimal execution in a way that allows Dodgr's flow to really shine. Watch the glitchy video for "Caverns" below and be on the lookout for Bone Music, due out early 2017. The next installment of Willamette Week's quarterly showcase, Pulse, is coming up tomorrow with a lineup that's set to liven things up. WW's Best New Artist Last Artful, Dodgr will be headlining the event with her lit, trappy beats and a tone of voice that brings even more intrigue to her flow. 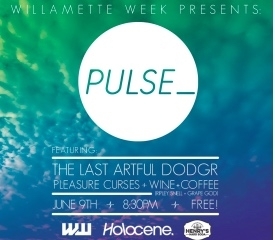 Current Deli Portland Artist of the Month nominees Pleasure Curses will be mixing up the night with a bit of electronica just after the new musical project from Ripley Snell and Grape God, Wine+Coffee, opens up the night with their experimental hip hop outlet. Pulse is a free, quarterly 21 and over event that's meant to feature some of Portland's best in the underappreciated hip hop and r&b scene. With lineup's like this and of Pulse's past, they're doing a damn good job at it. A good beat and some sick rhymes. When the search for a banger becomes a more arduous task than need be, these two key elements can make or break a song. 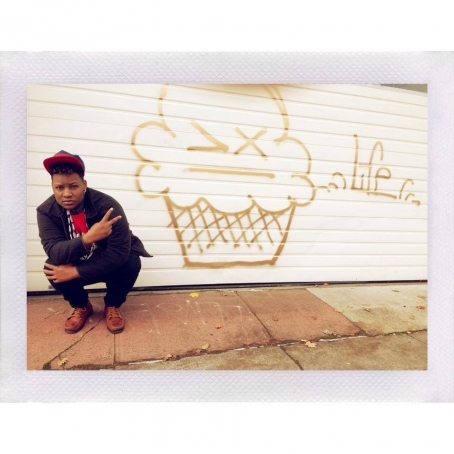 Thankfully, The Last Artful, Dodgr isn't green to what makes a hot track. Pigeons and Planes premiered the first release she's had since the Fracture's EP this past Tuesday. "Squadron" also happens to be The Last Artful, Dodgr's first music video. Her raspy tone hijacks Australian producer WNTD's beat in this nod to your #squad, but the whole package is one worthy of playing on repeat. It's the most fire two minutes you'll hear today, and the video will make you want to roll one up. Balto: Daniel Sheron's psych-Americana project is lyrically driven and big and melodic. His first record Call It By Its Name is a diverse mix of country, folk, and pop that sounds like Blitzen Trapper's love child with a dash of outlaw thrown in for good measure. Catch them at 6:40 p.m. on Friday. Golden Hour: Portland's tender-hearted garage group Golden Hour are like the younger sibling in a cool band that you never had but always wanted. Their catchy, relatable lyrics and upbeat, declarative songs will linger with you long after you hear them--in the best way possible. Don't miss their set at 4:10 p.m. on Saturday. Hands In: Bedroom psych favorite Erick Crosby brings his dreamy tunes to the stage Saturday evening at 6:50 p.m. Hands In provides the perfect soundtrack to your angst, your dance mood, or general party attitude. The Last Arful, Dodgr: A new voice in the Portland hip hop scene, Dodgr brings a fresh sound to the festival and holds it down for lesser-represented genres in the local music scene. Don't miss her breakout set at 6:10 p.m. on Saturday. The Stops: These self-described "five girls playing punk" do not mess around. Their fast, hard, sorry-not-sorry songs are sure to get the crowd moving at this weekend's festival. Representing the all-ages scene, their debut album Nameless Faces is a dirtier, grittier version of local favorites Summer Cannibals. Get down to Audiocinema early on Saturday, The Stops play at 2:10 p.m. These and many more perform Friday through Sunday at Audiocinema. The music festival includes a street fair, beer garden, and plenty of opportunities to get immersed in the Portland music scene.